Plus they have a cool looking bank logo. Recently they gave me $1000. For free. Since I have excellent credit, a few months ago, I was given pretty sweet sign on bonuses to get two of Chase's best consumer credit cards. Some people don't like getting credit card offers in the mail. I love getting them! If the bonus is worth it, I'll sign up for it. You can "opt in" to pre screening through this website. Chase Freedom: I received a sign on bonus of 30,000 points after any first purchase. These points are worth $300. This is a great card because it has revolving 5% cash back on different categories. This month it is 5% on all purchases made at Amazon and at gas stations. It's really an incredible deal. If you don’t receive a special promotion in the mail like I did to get 30,000 points after any purchase, you can still sign up to get $300 cash back after spending $500 in 3 months on the card here. 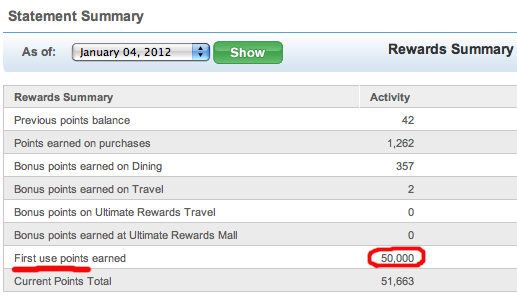 Chase Sapphire Preferred: I received a sign on bonus of 50,000 points after any purchase. These points are worth $500 cash or more if I converted to travel benefits. This card is great because it has 2% cash back on all dining purchases, travel purchases, and it has no foreign exchange fees. Also this card gives you an annual bonus of 7% on all points you earn throughout the year. This card gives you a 20% discount on airfare, hotels, car rentals, and cruises when booked through their rewards mall. In terms of card benefits, this truly is an elite card, offering benefits most other credit card companies can't compete with. This card has a dedicated help line which always guarantees that a live person will answer the phone, and you won't have to wait for a machine to screen your call before you are actually helped by customer service. There is a $95 annual fee to use this card, but it’s waived the first year. Don’t forget, it is an elite card after all. If after the first year, you don’t see the benefits from the card, you can downgrade this card back to the normal sapphire card with no annual fee. You can sign up for their standard bonus here, which gives you 50,000 points or $500 cash after spending $3000 in the first 3 months. As you can see here, I decided to take the cash on this bonus to pay $500 towards my credit card statement. 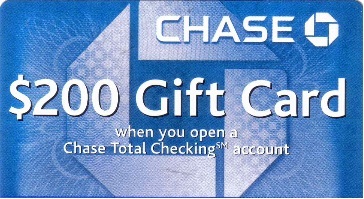 Chase Checking Account: Lastly, I received $200 bonus for opening a new checking account. If you've never had a Chase bank account, now would be a great time to consider opening a new checking account with them. 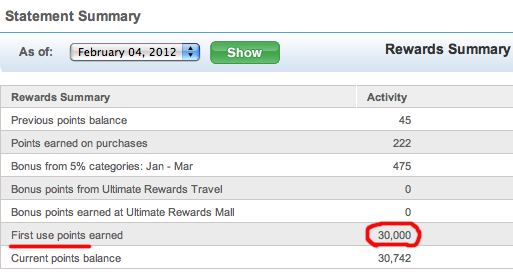 The $200 bonus for opening a new account expires on 2/24/2012. Maintain an average balance of $5000 or more in your checking and other types of qualifying Chase accounts (such as investment accounts); I don't recommend this since it's better to keep your savings elsewhere. On a side note: for the super ballers, JP Morgan Chase has a Palladium card. The Chase Palladium card is made out of the precious metal palladium and 23K gold and has laser engraving for your cardholder info. The metal of the card alone makes the card worth around $1000 if you were to melt it down for the precious metal. Ridiculous. 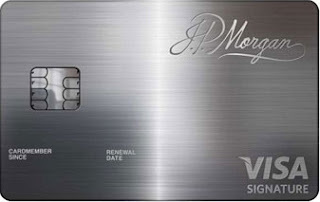 Don’t even think about applying for this card, as you need to have a private JP Morgan banker in order to qualify. And the average private bank client has $30 million in the bank! This card also carries an annual fee of $595. You can read a more in depth review of that card here. Chase has the best rewards program. Chase calls their rewards program "Ultimate Rewards." It is hands down the very BEST point reward system of any credit card company. Yes, it's even better than American Express Membership Rewards points. I really wanted to get one of their prestigious charge cards like the "Gold Card." However at this time, it's simply not worth it for me. To earn more points, you can go to the Chase Ultimate Rewards shopping portal to earn more than 1:1 points. The reason that the Chase ultimate rewards point system is so good is that it is completely flexible. You can truly use your points for anything. You can use it to get gift cards, electronics, travel tickets, The Chase rewards has an awesome 1 to 1 redemption ratio of converting points on different airline carriers and hotels including: Korean Air, Southwest, British Airways, Continental Airlines, United, Marriott, Hyatt and more. This affiliation is ridiculously good. The great thing is that if you don't want to spend your points on travel, you can simply convert it into a credit card statement credit, a personal check, or a deposit of cash made directly to your chase checking account. It's not the best value, since each point is worth exactly 1 cent. The best value would be to redeem for travel, which can be worth 1.5 to 2 cents each point. As you can see, Chase bank is the new hotness.